With numerous enhancements, upgrades and new features, FIFA 12 represents what is probably the most comprehensive and polished soccer title on the market to date. On the field, its new player impact engine gives the game a renewed sense of physicality and realism that makes it feel more authentic, making for smoother flowing matches, better player control and a huge selection of options. A seemingly endless array of features and modes gives players plenty of flexibility and depth with many game types to explore. FIFA 12’s visuals have also been noticeably enhanced by improved animation and a more cinematic approach that gives each match an epic feel. Look inside and discover why FIFA 12 creates the deepest and most entertaining soccer title on the market, surpassing last year’s already superb installment in almost every area. Playing FIFA 12 makes you appreciate just how much work goes into sports games. Each year, thousands of player profiles and team rosters need to be updated. Numerous new features need to be implemented in a relentless pursuit of realism. FIFA 12 does all of this effortlessly while surprising the long-term fan with new features and upgrades that make this the most impressive soccer title we’ve played on HD consoles to date. Starting with the way that players collide with each and extending down to every mode of play, EA’s FIFA Soccer 12 offers a fundamentally different title that changes and improves on nearly every aspect of the series. Start with the game’s much improved physics engine, called the Player Impact Engine. This gives each movement a more realistic, physical feel. When two players come into contact with one another, the results change dramatically. Instead of the same result each time, factors such as speed and level of impact make a huge difference in how things turn out. A minor contact won’t have much of an effect, but a major challenge will definitely change your player’s momentum and speed. The AI is much smarter this time, and opposing players will aggressively try and block your shots, making goals much more difficult. Your shooting accuracy depends on both you and your player’s skills. A good player should be able to connect easier, while a bad one will have a hard time no matter how hard you try. Making shots is hard to accomplish, as it should be and there are many close calls which can make thing frustrating at times. You can improve your odds by practicing shots in the arena and can also adjust FIFA 12’s difficulty level to match your skills. Adding to the pressure and realism is the new player physics engine, which makes opponents react and perform much more realistically, better representing their real counterparts. It gives then an almost life-like feel on the field, with realistic reactions to your commands. This makes on the field contact feel more unpredictable and gives the gameplay an authenticity most other sports titles lack. Players collide with each other in a more believable way each time, and this makes for a more challenging and physical game. This comes into play when you get on the field and find basic techniques from previous FIFA’s have evolved in terms of complexity. For example, passing the ball between players is much harder than in previous games, since opponents will step in and try and block the ball. You can still make some smooth connections between players, but you need to pay much more attention to player positioning than you did in previous games. Likewise, shooting is much more difficult with the opposing team acting much quicker, giving you less time to aim at the net. Sprinting doesn’t have the same super-charged effects it had in previous titles, so you won’t get as much of a boost as you’d expect. It makes for a more strategic and deeper style of play, and this authentic approach gives the game a much better flow throughout each match. You definitely feel like you’re on the field. This is especially true in the favorite “Be a Pro” Mode where you take on the role of a single player during the match. Here, the object isn’t to help the team, but to focus on your own moves on the field. During the match, you score more points for staying in position and keeping yourself ready for your big moment. When it comes, you had better perform. Your player is indicated by a star on the field and you have to be constantly aware of their position and what they need to do. While the previous games had you do this for the regular strikers and defenders, the new game allows you to play as a goal-keeper as well, which is fun and challenging enough to make it an entertaining game in its own right. As your player/character progresses up the ranks, your skill level will increase as well, which can affect your performance on the field in a big way. When you’re dribbling the ball, passing to a stronger player early on will earn you points. Later, when you’ve built up your status, take the ball yourself and aim for glory. This progression gives this mode and RPG element while helping to immerse the player further into the game. When the camera zooms and while you sprint, it creates a dramatic effect that pulls you in. You can definitely feel the changes in this mode as well, with more realistic outcomes, even injuries for aggressive players, that makes the game feel all the more authentic in its approach to the game. One of the more unexpected things about FIFA 12 is how natural these changes feel. There are some changes in momentum and changes to the dribbling system and player AI make a big difference. However, EA hasn’t changed the basic controls and interface too much, Those used to the older games control scheme will find it almost the same, but its subtle changes in the way players perform after colliding with others makes a huge difference in your strategy. Once you’re in command of the players, you’ll find a much more coherent set of team mates who feel like they’re reacting to your movements, not mindless robots following predetermined paths and moves. As a result, FIFA 12’s on the field action develops and flows much better than previous installments. One of the most impressive aspects of this is how the game mimics the pacing of real soccer, with impressive ‘builds’ that gradually increase in their intensity. Interceptions lead to dribbling then, passes lead to possession. These build into attacks down the field and finally climax near the net with a final shot at the goal. Its definitely more noticeable this time around. Also improved is the overall team strategy controls, which allow you to set your squad’s offensive or defensive posture at several levels ranging from a tight defense to an aggressive attacking mode. These actually significantly affect not only where players are positioned on the field, but how they react to the action, which makes the game even more intense. Players will also notice that the AI is much stronger this time around. Defenders on your side do an excellent job in protecting you and passing that the previous games lacked, they’ll converge on your position when you get the ball and help keep the other team at bay for awhile if they can. On the other hand, your opponents are also quicker to get in your path, but your players have improved dribbling techniques that help to balance this, making for a more authentic experience. The game’s new controls in this department are more precise, giving you a better feel for the ball and making you feel like you’re in command of its direction. As in the last few games, you need to look ahead and time your runs or else face a brick wall when you approach the goal. Once you get there, you’ll find that the goalkeepers are much smarter, giving you less leeway in your shots. They won’t hesitate to attack if you leave yourself vulnerable, so you have to be careful when setting up your shots. Thanks to rules changes, aggressive play such as hard tackles is discouraged more this year. It’s easier to draw a foul, even when performing minor challenges, so you need to use these carefully and sparingly. When you’re on defense, it pays to keep a little distance but you can still put pressure on opponents if they come into dangerous sections. FIFA 12’s new physical play sounds a little intimidating, but the realism makes up for the added complexity. Most players will find the game is still easy to play after you get over the learning curve, but its a little steeper this time around. Using the online pass unlocks the game’s online and multiplayer modes and begins your access to the new EA Football Club, which will keep track of your progress and activities through multiple titles including next year’s FIFA Street reboot. Its fairly easy to sign-up and activate your account, and once you do, the sheer scale of the online game is quite impressive. While the improvements in the single-player game are extensive, the online component hasn’t been ignored. Once you log in, you can use your created player or a real-life one to compete in a seemingly endless number of match variations and themes. FIFA 12 lets you compete in a number of real-life leagues with your character, then share these customized players and even entire teams online. After you’re done with a single match you can then compare yourself against others with leaderboards, compete in multi-tiered tournaments with others online plus these are fully customizable as well. You can also play through a real season with your favorite teams week by week or in customized form. This is a really cool feature that allows you to follow and play along with real clubs’ progress through the season. You can play against others online with your customized team in leagues, upload your own created characters’ stats, get online stats for real teams, read match updates and much more. If this isn’t enough, EA has added several significant features this year that include the ability to play friendlies online and compete in season mode head to head with other players. All of this gives FIFA 12 an extensive and deep online component that’s easy to use and navigate and integrates seamlessly together to create a deeply engaging gameplay experience that sets a new high standard for online play. 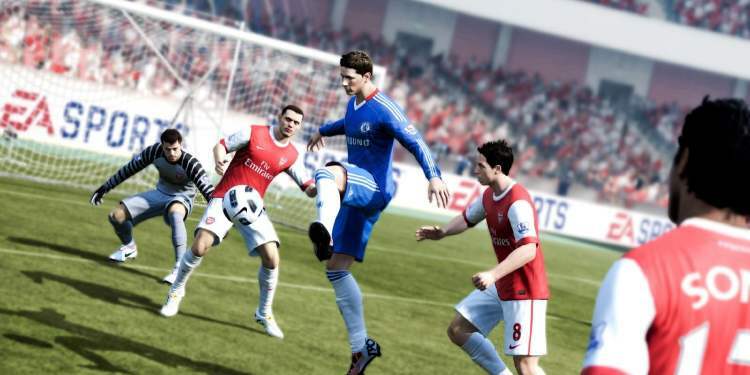 In terms of its production values, FIFA 12 has enhanced the series’ presentation in some important areas. The game’s menus have been streamlines and are easier to navigate, making it easy to find and switch between different gameplay modes. As expected, the television-style presentation adds an exciting flair to the matches, and the accompanying in-game commentary is succinct and occasionally clever. Atmospherics remain excellent with crowd-chanting and the roar of the crowd when you’re on the attack. Backing off from the excessive music from previous installments, the tracks this time seem to blend in better this time around. You can adjust a number of factors such as the match length, time of day and weather with the options menu and turn the chants, commentary and music on or off as well. There’s an excellent selection of camera angles which range from a top-down, side-view perspective as seen in most soccer titles to more elaborate on-field modes, seen in the be-a-player mode which are effective at making you feel like you’re on the pitch. The player animations remain fluid and lifelike this time around, and there’s been some slight improvements in appearances with improved facial animations and more celebration routines. This remains one of the slickest looking sports games on the market, and the complete package is impressive on all fronts, creating the most believable soccer game experience on an HD console, from a visual perspective. FIFA 12 excels in most areas, but there are a few minor problems that reduce its otherwise flawless gameplay. One of the things you’ll notice is that many of the customization features are grayed-out when you first play the game. These are now unlockable, which is annoying – you have to earn some customization areas and many other individual items during the game. There are also some sections of the game that take a long time to load, which is understandable given the game’s depth and its large array of game modes. These are minor problems when compared to the larger picture, and in that sense, it seems like you almost have to search for negatives on purpose. When you look at the game in totality, it doesn’t fail to impress. Its new physical player contact engine adds realism to the game’s already superb play, while its intuitive controls keeps things accessible for the average player. Its extensive strategy becomes evident as the matches unfold with pushes and pulls, plus the occasional sudden change that keeps things exciting. FIFA 12 is quite playable from the start, but unlike many other sports titles, it becomes more enjoyable as you delve deeper and discover the subtle strategies and nuances that set it apart from other soccer games. When all is said and done, this is an impressive game by any measure. Earlier installments set high standards, but this year’s edition surpasses all of them. FIFA 12’s quality, depth and challenge are unrivaled, making another crowning achievement for the ascendant series.